It is a while since I last wrote a post. Life has been a bit hectic. I was expecting it to have been even more hectic as we are half-way through the swarming season, but I have only collected one swarm so far this year. The rest of this post is about that swarm. A few days ago I received that pleasant call at about 16.00 from someone in the local town to say that he had just seen a swarm of bees land in his back garden. I had received about eight calls so far this year, but for one reason and another, I was not able to pick the bees up. So I was determined to get this one. In any case, I have two people in our area that wanted to start beekeeping – and who had no bees – so there was even more pressure on me to collect. 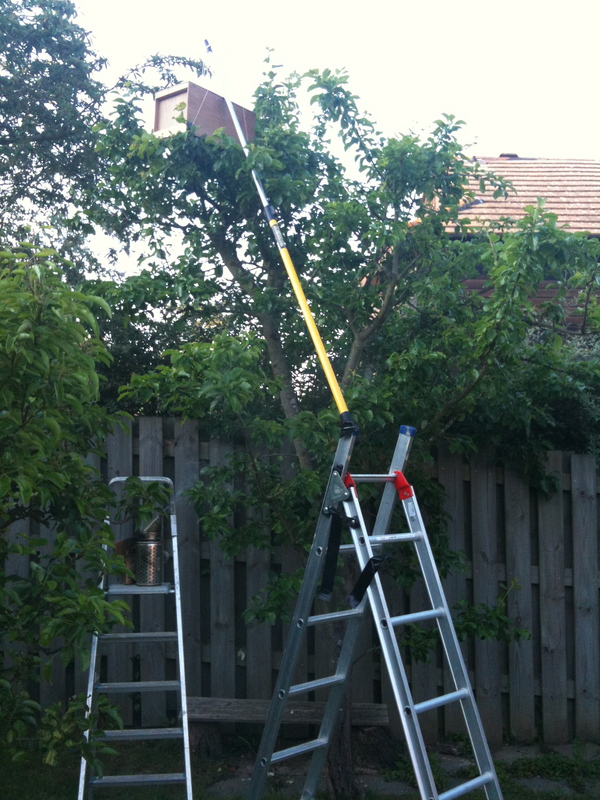 The swarm was right at the top of a pear tree – about 10-12 ft up, but the owner only had a 6ft ladder. So here, I though was a chance to try out my new pole catching contraption which I had designed after the only swarm that I did not catch successfully last year (it was about 16ft in the air – though on the call, the woman had told me it was only about 8ft. Height off the ground and accessibility are two really important issues when catching swarms! In one movement I swung the box up on top of the tree, pretty much right on top of the swarm. I then secured the handle of the pole to the top of the step ladder with some more duck tape so that the pole stayed in position until it was time to swing the box back down to the ground. I then went shopping for about an hour and waited for the bees to climb up into the box. When I returned, most of them were in. With a little smoke, the rest went in over about 15 minutes. I then took the pole and lifted the box off the top of the tree. It was much heavier! I swung the box back to the ground and placed it on the step ladder to encourage the rest of the flying bees into the box. Overall it was a great success. The swarm was housed in my garage overnight before deciding who to give them to. The next morning I rang the prison. They were delighted. It was only the day before had they been saying they wished to have some bees. So I went over there with Andrew to put them in their new home. Since our first site visit, (where we had found the old place where the vodka bees were kept), the prison staff had decided to move the site for the new apiary into the prison gardens – behind the wire. So that is where we put the bees. It took about an hour and I gave a short lesson at the same time. Mick, the prison groundsman was thrilled. The bees had finally returned to the prison. As I left through the main gate, I joked at the guard that he now had about 30,000 new inmates, that none of them had names or passports and that quite a few were already breaking-out through the fence! He laughed. Little did I know how true my analysis was. It was only yesterday did I ring Mick to find out how they were getting on. I wanted to offer him some help on his first inspection. He was quite low in spirit. He had gone into the hive on Monday and only found about 100 bees in it – though they had drawn-out quite a lot of comb. Last Saturday was a VERY warm day and I can only think that they had become uncomfortable in their new hive and found a better location. So the swarm really had escaped. So it is back to the drawing-board. We must find a location where the bees want to be. I am in favour of the old site (bees naturally seem to come back to where they have been before. We shall have to see. One thing for sure, though is that bees don’t like being kept prisoner. They will definitely buzz-off if you don’t give them a good spot to make their home! In this case, I think the site was a little exposed and possibly quite uncomfortable in the direct sunlight at about 11.00 am in the morning. We live and learn!